Our commitment to today’s generation is to fight obesity and celiac disease by incorporating highly digestible, gluten free lupin flour in any food formulation! 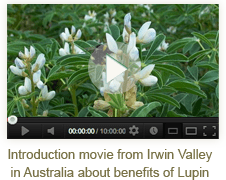 Sweet Lupin is uniquely high in protein (up to 40%) and dietary fiber (30%) low in fat (6%) and contains minimal starch and therefore has very low Glycemic Index (GI). In terms of nutritional and health benefits on offer, lupin bean is an attractive ‘GM free’ alternative to soybeans. The protein and fiber components have excellent functional properties and can be used in various processed forms, including in a range of highly palatable bread and baked goods, meat products and beverages. However, the most exciting story to emerge is lupin’s amazing attributes with regard to health and in particular obesity and the metabolic syndrome, which includes a cluster of factors such as high blood pressure, insulin resistance and elevated blood cholesterol. Lupin flour inclusion into white bread significantly reduces the blood glucose response and the insulin response. Lupin fiber acts as a soluble fiber and drops total cholesterol without affecting the HDL cholesterol. Lupin proteins have also been shown to beneficially modify serum lipid profiles by stimulating liver cells to take up and degrade LDL cholesterol. Lupin foods reduce transit time, lower the colon pH thereby reduces the colorectal cancer risk, and act as a ‘pre-biotic’.